Not gonna lie — I’ve had a whirlwind week! I won’t go into details, but Wowza, what a week! However, I knew it would be and planned ahead. In my last TCC post, I said that usual Sunday post would be a bit late, but it’s here as promised. Below are some job ads and great blog posts from the past week. Lessons Learned Blogging as A Freelance Writer | I recently had the chance to write about my blogging experience on of the top WordPress blogs on the web (I also happen to write for them every week). I dive into how Blogging is different from regular writing and how editing is important but that even the best will miss a word here and there, and I touch on what it takes to get started in the blogging world. Why Moonlight as a Freelancer is GOOD for Your Day Job | You’ll often hear that you can’t be a good writer while working a day job. But is that really true? Michelle touches on how being a part-time writer can actually be a good thing, even if you’re still working for the man. 5 Lessons From J-School That Will Make You a Better Writer | Journalism is what you could call a… structured art. AP Style and grammar know how are not just important, they are essential, and the lessons that Tanner reveals will undoubtedly help writers of all styles and genres. 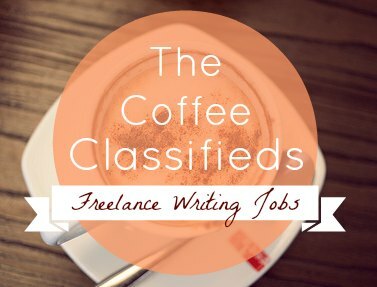 The Easy Way to Earn More Money as a Freelance Writer (No Marketing Required!) | It’s no secret that I love anything and everything Carol Tice writes about on her blog. I’m with Linda (of Renegade Writer) who says she “religiously reads” Carol’s blog. This post is sure to help a few who have landed blogging gigs, but can’t seem to make more money. 5 Tips for Writing a Travel Blog That Really Stands Out From The Rest | Aspiring travel blogger should definitely read this one. That rounds out this week’s Coffee Classifieds. My work and life are crazy busy this week (as I’m sure it will be for many more), so I’ll do my best to get another post up this week, but chances are that it will just have to wait till next week. I really want to hear from you guys about what you’d like me to write on the blog. Any suggestions? Any questions that you would like answered? Be sure to let me know in the comments.